Vancouver, B.C., November 29, 2018 - Zinc One Resources Inc. (TSX-V: Z; OTC Markets: ZZZOF; Frankfurt: RH33 - “Zinc One” or the “Company”) is pleased to announce that all data from the 2018 drill program at its 100%-owned Bongará Zinc Mine project in north-central Peru have now been compiled, interpreted, and modeled by Watts, Griffis, and McOuat Ltd. (“WGM”) based in Toronto. The data will be used to complete an independent mineral resource estimate for the near-surface, high-grade, zinc-oxide mineralization encountered at the Mina Grande, Mina Chica, and Bongarita deposits expected to be released in early 2019. The mineral resource estimate will be the basis for a Preliminary Economic Assessment expected to be completed late in 2019. Readers are encouraged to review Figure 1. carefully which shows the upside potential by further delineation (red-proposed platforms) as well as the upside potential by exploration (black - proposed platforms). Beyond this proposed drill program is the 8-kilometre-long trend which the Company believes also contains additional upside exploration potential. and near-surface zinc-oxide mineralization. 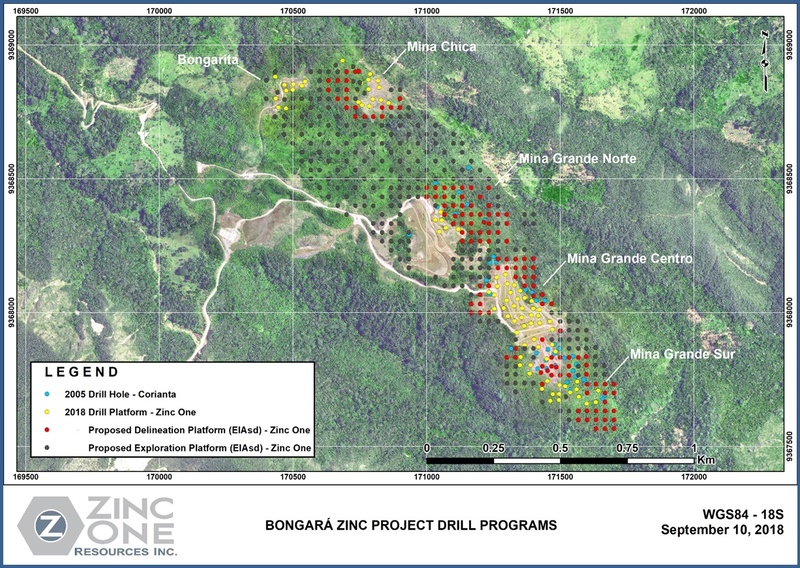 High-grade, zinc-oxide mineralization is known to outcrop between the mined area and the Charlotte-Bongará Project, which is over six kilometres to the north north-west and where past drilling intercepted various near-surface zones with high-grade zinc as well.